Blue Trust Loans, formally known as Hummingbird Funds LLC d/b/a Blue Trust Loans, is a payday lender based in Wisconsin. While many Blue Trust Loans reviews can be found online, we’ve pulled together the most current information to make your life easier. If you are thinking about borrowing from or doing business with Blue Trust, you’ll want to keep reading. Blue Trust Loans was founded in 2014. They specialize in installment loans of up to $1,250 for returning customers or $1,000 for first-time borrowers. They offer weekly and bi-weekly repayment terms ranging from six to 24 payments. The company is owned by a federally-recognized Native American tribe. Customers come from all 50 states and must be 18 years or older. Borrowers must have a checking account that has been open for an undisclosed period and must show proof of a direct deposit income. If an individual has filed for bankruptcy, or is planning to file, they are ineligible for Blue Trust’s loan products. The application process is straightforward. For a potential borrower to get a loan, they must complete an online application, which then gets sent to the lender’s underwriting department. A customer service representative may follow up with a phone call to confirm certain details. Within an hour, the borrower will receive a decision; during business hours, the response time can be as little as five minutes. If a loan is approved, the money should be in the borrower’s checking account the next business day. Blue Trust loan reviews are overwhelmingly negative. This is a frequent problem with payday lenders; usurious interest rates lead to many complaints. A potential borrower should try every avenue to find money elsewhere before resorting to a payday loan. Blue Trust Loans was started by a Native American tribe known as the Lac Courte Oreilles Band of Lake Superior Chippewa Indians. 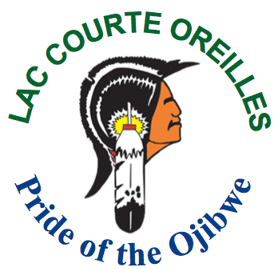 The proceeds from the lending business go to support members of the tribe. The lender states that a borrower cannot sue for any reason. However, a 2014 court decision allowed borrowers to sue Native American payday lenders in federal court. Pending legislation in Indiana may change the laws there, too. For now, the current legal situation is unclear, and it’s safest to assume that an attempt to sue will be unsuccessful. 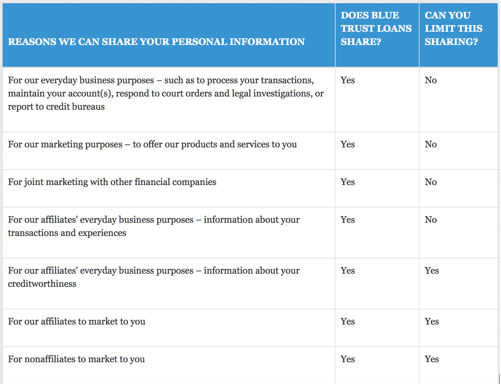 When doing business with Blue Trust Loans, there is a limited number of “potential forums for dispute resolution.” If an individual wants to sue, they may only do so in tribal court in Wisconsin. Instead of suing, a disgruntled borrower may have to use informal dispute resolution or binding arbitration. Blue Trust Loans has not waved sovereign immunity, which means they have not consented to being sued in any court. 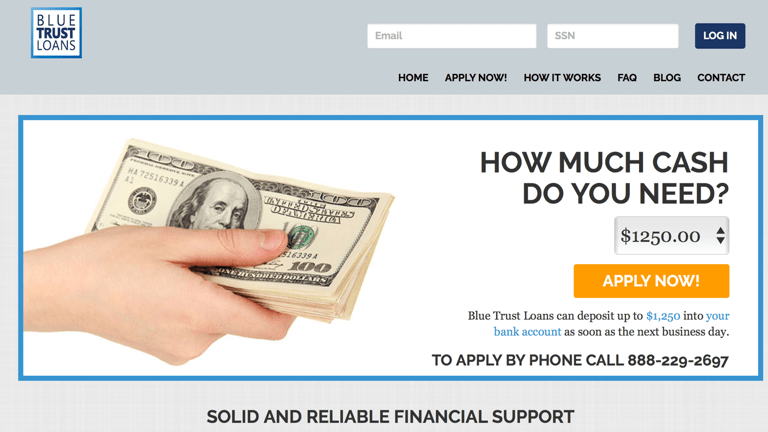 Blue Trust Loans was started on March 7, 2014. It is organized as an LLC and run by Ms. Cynthia Miller, the Compliance Officer, and Ms. Trina Starr, the manager. It is unclear how many employees they have. Blue Trust operates from an office in Hayward, Wisconsin, about 280 miles north of the capital, Madison. They give a phone number, fax number, and email address, and have both a P.O. Box and physical address. They also offer “advanced customer service,” although no explanation is provided about how this differs from regular customer service. The company is privately held, and little information is available about their income, strengths, customers, or expenses. Applying for a loan is free, fast, and easy, but the loan terms and interest rates might be confusing. The application itself contains three parts: personal information, income information, and banking information. It should not take more than a few minutes to complete. The applicant should have their checking account information handy. There is no information available about fees, either during or after the approval process. To prevent any surprises, an applicant should ask about origination fees, late fees, and any other charges. Payday loans are expensive. This company charges rates that range from 471%-841%. A borrower may end up paying more than twice the amount of the loan! There is no discount for paying the balance early. If a borrower prepays, they still must pay all the interest, as if they had made just the minimum payments. A new borrower must have a verifiable source of income. The income must be direct deposited into a checking account. A borrower must be at least 18 years old and a United States citizen. Take-home pay must meet certain unstated minimum levels. No borrower or co-borrower may be a debtor in a pending bankruptcy case. Borrowers are also asked if they intend to file for bankruptcy during the loan repayment period. No mention is made of a minimum credit score; in fact, a paragraph on the lender’s home page states that most payday lenders do not rely on credit reports from any of the big three reporting agencies. A loan application may not affect your credit score. A recently discharged bankruptcy does not appear to be a barrier to approval. Once Blue Trust’s underwriting department has reviewed the application and verified all necessary information, they will make a decision. During business hours (Monday-Thursday 07:00-20:00, Friday 07:00-19:00, Saturday 08:00-16:00, and Sunday 08:00-15:00, all CST) an applicant can expect word within sixty minutes. Many borrowers get a decision in just five minutes. If the lender issues an approval, funds are deposited into the applicant’s checking account. It should take just 24 hours during the work week. If a successful borrower submits an application on Friday afternoon, they will not see the funds until Tuesday. But if the borrower applies on a Monday morning, they will have the funds on Tuesday. Should a borrower change their mind after loan approval, they may cancel as long as the rescission period has not ended. This period begins upon approval and ends at 17:00 CST on the day of disbursal. The borrower must fax or email a cancellation request. If the lender can stop the wire transfer or can debit the already-disbursed funds in full from the borrower’s account, the transaction will be canceled at no cost. Loan documents are automatically provided online, but if the borrower does not have a printer, the lender will fax or email the documents. There is no advertised way to request a hard copy of the paperwork. While terms are always included with the loan documents, the language of payday loans can be confusing. Customers who pay every two weeks, and those who pay twice a month, must repay their loans within 12 payments. Customers who pay weekly will make 24 payments. Customers who pay monthly make 6 payments. All loans must be repaid over approximately six months. THERE ARE NO PREPAYMENT DISCOUNTS. Even if a borrower pays the full loan amount the day after receiving the money, they are still responsible for all the interest that would have accrued over the full 6-month loan period. The loan paperwork will contain all payment terms. The borrower can see the loan amount, monthly payment, interest rate, and the total amount of all payments. This information is usually provided in small print and overlooked by borrowers. But, with payday loans, it is vital the borrower understands everything they sign. The BBB notes the rating improved because Blue Trust Loans resolved twenty of the twenty-three complaints. Unfortunately, this improvement was not enough to raise the grade above an F.
Besides the failing rating, every Blue Trust Loan review on the BBB site has one star, based on six published customer reviews. This five-star rating is separate from their well-known A-F scale. Take the information about BBB reviews a grain of salt. The Better Business Bureau is a for-profit organization, and even TIME magazine has complained about their practices and fake ratings. Blue Trust Loans has never paid to be a member of the Better Business Bureau, and this may be one reason for their low rating. The Blue Trust Loans reviews are not checked for authenticity, and there is no way to determine the intent behind the reviews. Still, the file at the Bureau has only been open since February 23, 2015. The 23 complaints were made in just 13 months. The negative reviews were left over a period of two months, from January to March 2016. One consumer in early 2016 was told they would have to pay a total of $3,000 to pay off a loan that was originally $825. A borrower in November 2015 had to pay $4,272 to release a loan with an original balance of $1,250. In February 2016, a borrower paid $1,764 on an original loan balance of $600. Every public complaint appears to concern the interest rates. Loan terms are always disclosed up front, but many consumers sign paperwork without reading. Unfortunately, they then find themselves paying far more than they expected. A quick review of the loan terms – before signing anything – should prevent most of these nasty surprises. The problem of high interest rates is not unique to Blue Trust; usury is an industry-wide problem. However, Blue Trust responds to most complaints politely and in great detail. They do not seem to have customer service problems so much as their customers are unhappy with high interest rates and fees. Blue Trust has their business listed on several websites operating through affiliate programs. This means that other individuals or companies can advertise payday loans under their own name. If a person applies through an affiliate, the loan is sent back to Blue Trust for processing. If approved, the borrower will complete paperwork with the lender, and the affiliate will receive a commission. There is no way to prevent all information from being shared. Anyone who applies for a loan is likely to be inundated with unrelated sales pitches. 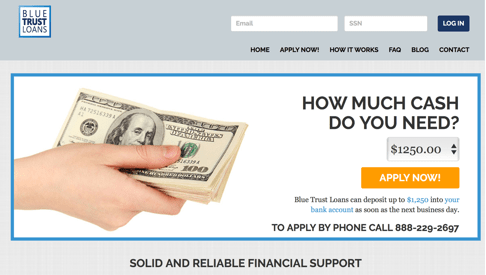 Is Blue Trust Loans Right for You? A payday loan is one of the most expensive ways to borrow money. Banks court desperate customers who have few other options. Few lenders make it easy to understand the true cost of borrowing. A payday loan can seem like a great way to get cash and make it through to the next check, but high interest rates make even a small loan seem overwhelming. Exercise extreme caution if you apply. There are many complaints about Blue Trust Loans; however, this is standard across the payday lending industry. Blue Trust does respond to the majority of complaints made against them. 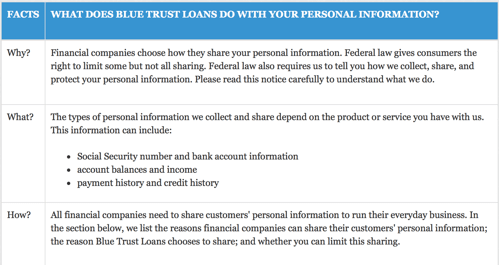 It appears Blue Trust Loans values a good reputation, and they will work with customers. At the same time, they don’t budge when it comes to their high interest rates. If you need money fast, and you can’t get it from a friend, family member, credit card, or another type of loan, a payday loan may suit your needs. Blue Trust Loans is a nationwide option and is worth considering when times are tight.